Walk The Moon fans get excited!! The Ohio-based band are back and bigger and better than ever, with the brand new Press Restart tour to support their latest album “What If Nothing”!! 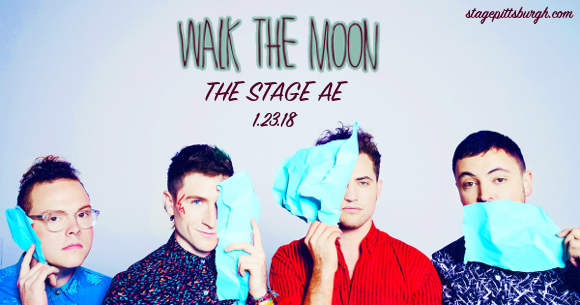 On Tuesday 23rd January 2018, Walk The Moon will arrive at the Stage AE for a night of the most infectious and danceable live pop-rock that money can buy!! This is the show we've all been waiting for… Tickets are in high demand, so don’t delay!! Grab your tickets NOW! Walk The Moon saw their beginnings when vocalist and keys player Nicholas Petricca started the band in 2008. After a few line-up changes, the band formed into a four-piece with Eli Maiman on guitar, Kevin Ray on bass, and Sean Waugaman drummer. In 2010, the band released their first album, “I Want! I Want!” and gained popularity with the public and critics alike, leading to them signing with RCA Records and promptly going on tour to support bands such as Weezer and Panic! At The Disco! In 2012, they released the self-titled album “Walk The Moon,” which saw the explosive single “Shut Up and Dance," shoot to the top of the Billboard Rock Songs chart and Billboard Alternative Songs chart and make it to the top 5 of the Billboard Hot 100!! On the back of this massive success, we can hardly wait to see what Walk The Moon have in store for us next!! Be among the first to hear all the new material live – get your Walk The Moon tickets TODAY! !